Hobbs Bonded Fibers has been committed to quilters and the quilting arts since 1978. By staying in constant contact with our customers, we strive to be the highest quality provider of quilt batting and the industry leader in product development. Your feedback at quilt shows, on our website, via email, and on our Facebook, Instagram, Pinterest and Twitter pages continues to help us develop a wide array of premium products. Hobbs manufactures the most complete line of quilt batting (wadding), pillow inserts and fiberfill in the industry. Our diverse manufacturing processes allow us to have capabilities that are the most sophisticated in our industry, thus guaranteeing the finest quality and service possible. It is our policy to provide on-time delivery of products which consistently meet or exceed our customer’s requirements and expectations, and to create a culture in which we continually enhance the quality of our products and internal processes – this is accomplished through a strategy of continuous improvement, training and management involvement. We strive to always deliver the best batting products to you, our valued customers, and we stand behind every batting product we manufacture. To assist us in providing a replacement product to you in the event one of our products doesn’t measure up, we encourage you to keep the packaging and labels from your Hobbs products – in the event you need to contact our customer support department, the information on our packaging and labels helps us provide your replacement and track down potential production issues. Quilters, you will find your favorite Hobbs products at your favorite local quilt shops, fabric retailers and/or general craft stores. Ask for Hobbs Tuscany, Heirloom, Poly-Down and Thermore products by name. If your nearby retail store doesn’t yet stock what you’re looking for, ask them to order it for you either directly from us or though one of our many distributors. 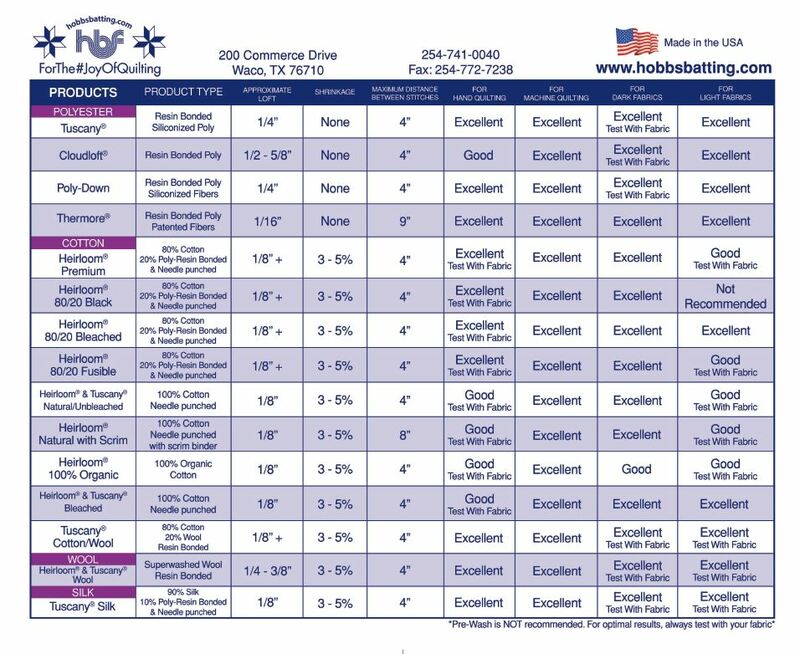 If you’re unable to locate Hobbs products in your area, please call us at 800-433-3357 and ask for the Customer Service Department – we’ll be happy to connect you with a local or online retailer, and/or distributor, that’s most convenient to you. Distributors & Retailers, we consider you to be our partners. Hobbs offers a wide array of products to meet quilters’ needs and we’re happy to provide you with the education, sales and/or point-of-purchase resources you might need. Additionally, we’ll do our best to keep you informed about the latest additions to the Hobbs product lines. Please call our Customer Service Department at 800-433-3357 or email us at sales (at) hobbsbondedfibers (dot) com. Thank you for your enthusiastic support of our products and our company – we appreciate your business and wish you happy quilting!